Goa Trance scene and his involvement as co-producer on the seminal album ‘Cosmology’ on Transient Records as one half of Cosmosis, Laughing Buddha developed his solo career with releases on Flying Rhino, T.I.P. Records, Dragonfly (as Drum Druids) and other labels, before moving on to the green and exciting pastures of the Nano Records team. Jez “Buddha” is a highly experienced Live Act and DJ and anyone who has seen him perform will confirm that he lives up to the name of the Laughing Buddha! He brings a unique ego-free energy to every party he plays at, truly coming to life and invigorating the crowd with his driving technical masterpieces and jovial stage presence. Following the release of his debut solo album ‘Sacred Technology’ in 2010, Jez ‘Laughing Buddha’ has been going from strength to strength. His collaboration album 'Illusions and Collusions' which featured collaborations with the likes of Eat Static, Tristan, Avalon, Dickster, Space Tribe, Electric Universe and others, only cemented his position as an irreplaceable addition to any lineup thereafter. Gigs at Ozora, Boom, Sunburn, Atmosphere, Utopia, Glade, Maitreya, Psychedelic Circus, Indian Spirit, Indigo, Universo Paralello, Origin and multiple tours of India and many other countries have made 100% sure that Laughing Buddha is now a household name on the worldwide PsyTrance scene! Space Buddha is Eliad Grundland (born in 1972), this project was created in the year 1997 & since then had released 10 powerful albums. During the years Space Buddha created an active portal to the Goa Full-on dancefloor reality. Space Buddha had visited every continent of our planet while touring with his music & had participated in many unforgettable festivals worldwide. 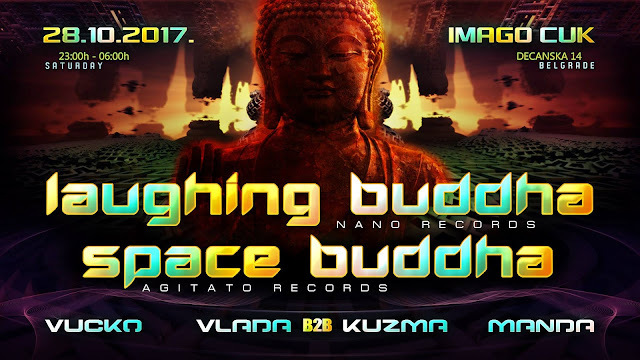 The Space Buddha intensive drive nature, super high energy sound, massive fireback & Goa atmosphere will shake, blast, twist & pump every molecule of your body & mind. Space Buddha project is well known with its unique interpretations as its setting new standards & limits to the Psy trance scene.